I thought I’d share one of my strategies for taming the take-out monster. Like everyone, I have days where I either don’t feel like cooking or I’m too tired to cook. Ordering two large pizzas can cost quite a bit even if you have coupons and eating out in a sit down restaurant will cost us even more even if we order water with our meals. So one of the things I try to do is to have something ready in the freezer that won’t take long to cook. That’s why I’m a dump cook! 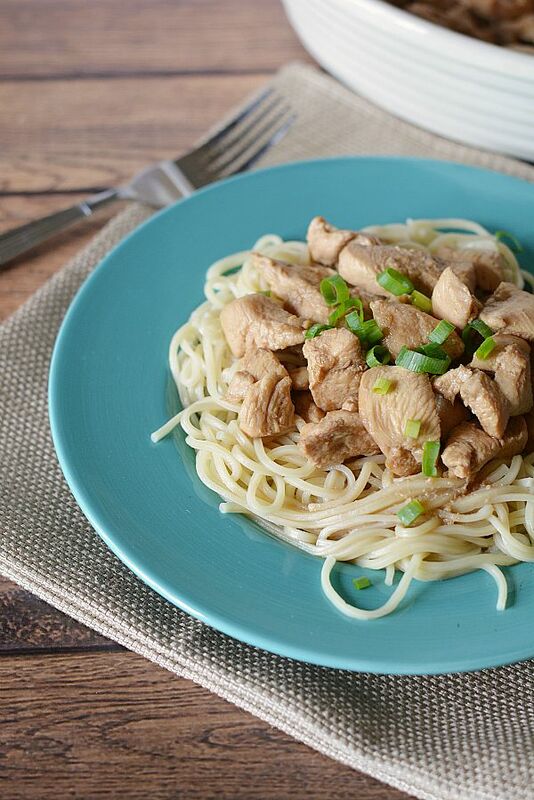 These are easy, freezer friendly dump chicken dinner recipes that you can make ahead. 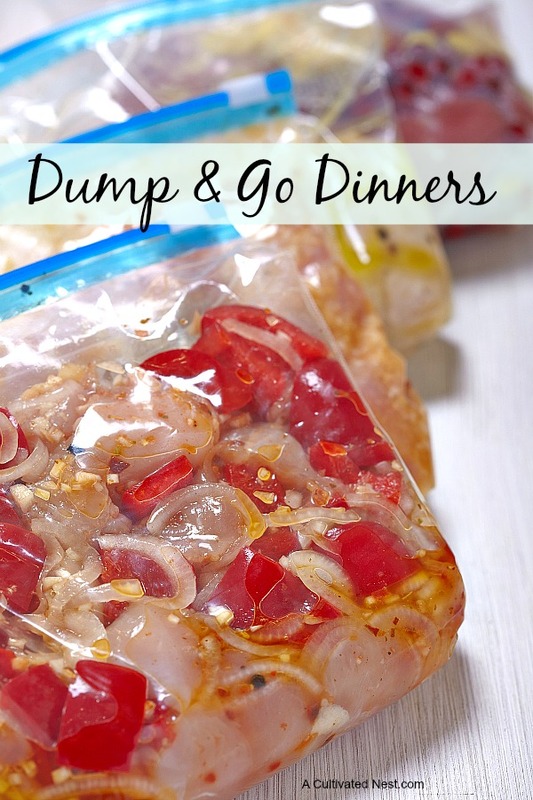 Dump & Go Dinners! Dump cooking just means that you Dump your mix into a gallon freezer bag with your chicken (I’ll do one for meatballs another day) and freeze it. Then when you want it you Dump it into a pan and cook it! Or stick it on a grill and cook it. You have a no fuss easy to make ahead dinner! I like boneless skinless chicken breast because they’re quick and low fat. Kroger had them on sale last week and I always stock up when the price is low. But this will work with everything – wings, legs, thighs, bone-in breast – just adjust your cooking time. You can use fresh chicken or add the marinades to those individually frozen chicken breast (do not defrost and re-thaw). For defrosted boneless skinless chicken breast it’s about 25-35 minutes depending on how hot your oven runs. For other chicken pieces it can run closer to an hour. You can also use your crock pot too! You may want to season your chicken pieces with salt/pepper in addition to the marinades. This just depends on your individual tastes. Dump all ingredients including chicken pieces in a gallon size freezer bag, squeeze out as much air as you can, label your bag, lay flat in freezer. Once frozen you can stack them on end to save space. Just take your bag and DUMP into a greased baking dish-Cook at 350 in preheated oven until done usually 25-35 min for defrosted chicken breast. For crockpot: Cook on LOW for 6 hours or on HIGH for 4 hours or until no longer pink. *****All recipes use 4 boneless skinless chicken breasts or 8 – 10 boneless chicken thighs (which you can cube before freezing if you prefer or leave whole). I recently made this and took some new photos. I served it over Low Mein noodles. Delish! Even if you dump a 1/2 bottle of barbecue sauce in a baggie with some chicken and then freeze it for later use you’re ahead of the game! 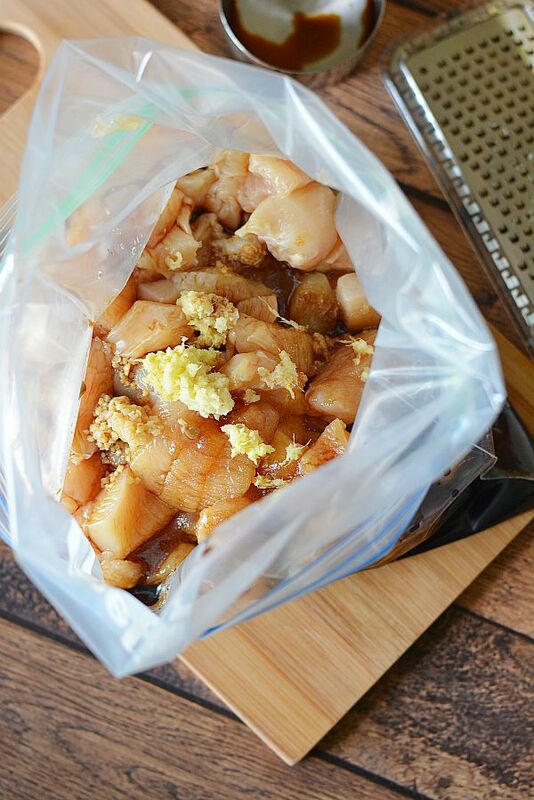 Or maybe you have your own favorite marinade recipe – try that as a dump recipe. These are very forgiving dinner recipes AND most of the time you’ll have everything you need already in your pantry. 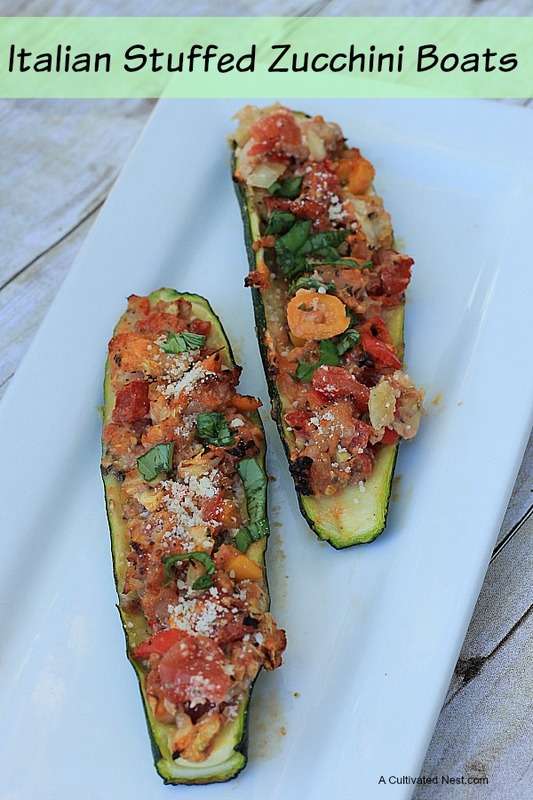 What’s your favorite easy to make dinner recipe? What a clever idea! And thank you for the marinade recipes. I am always stuck in a rut when it comes to chicken. Thanks so much for the recipes!!! And what a great idea. I normally make things up and then freeze them, but I think I may like this idea better! thank you for sharing the recipes and technique! i think i may have to try your ideas! Some great ideas, Manuela!! We all need some inspiration to mix things up a bit! Thanks! What great recipes! I plan to try them soon. I watched Nigella yesterday morning and she did something similar for a make ahead meal (although in the frig and not the freezer). Good morning Manuela! 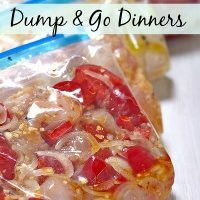 I love your dump recipes (and the name is so fun). I am looking forward to trying them out–they sound amazing! I love the concept of pre preparing them uncooked. I always do extra freezer recipes with cooked foods such as slow roasted beef and meat loaf (including a gravy packet) and, of course, marinara sauces and lasagna, but hadn’t thought to freeze uncooked and pre-marinated recipes! So clever of you. Thanks so much for sharing all your great ideas. You are such a kind kindred spirit. Saturday usually is my cooking day. After my groceries shopping in the morning, I start to make pre-cooked meals and froze them for the week. At least I try to make three meals this way. Being out of home 10 hours a day forges you to be practila, I guess. Manuela you are definitely my kind of dumper when it comes to blackberries. That is one of my favorite things. We have mulberry tree that bears so many blackberries that it is impossible to get them all. The bluejays love them too. I too at times do what you do as it saves time. Thank you so much for sharing your always good info. Take care, have a great Sunday. I love freezing berries also. My youngest came home with five buckets full of blueberries last spring and we’re still enjoying them! Thanks for the “dump” recipes. 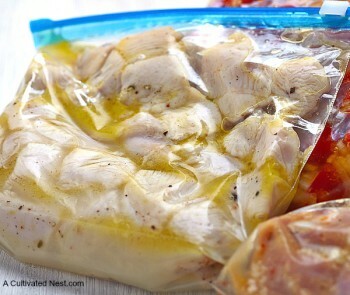 I hadn’t thought of adding the sauce to the chicken breasts when I freeze them – can’t wait to try them. Have a great week. I will try some of these dump recipes. My daughter and I make a lot of freezer meals for our farmer husbands. We are so busy with our yards and gardens in the spring that these time saving meals are life savers. Right now, we are starting to freeze lunches to take out to the fields when spring planting begins. We also freeze muffins, cupcakes, and cookies which are handy to pack in their lunches too. Thanks for sharing! Love your stuff, and added you to my blogroll! I too, have many berry trees (mulberry) and about a dozen raspberry bushes. I freeze in the late summer and snack in the winter! great ideas I will have to try out. We are always short on time. Can’t wait to see your valentine decs. We do the same with blueberries. I froze 20 pounds that I hope will last Bob all winter. Blueberries are horribly expensive this time of year! I’ve seen other people dump cook too but I have to admit I never think of it myself. What a smart cookie you are! Awesome post!…Im using these recipes for sure! !…One thing when we moved in here they had black berries in the garden…We had a time with them…How do you care for them? Thanks for visiting my blog! I love the pink and red toile! It’s my favorite! Love the blog! OH NO! You’re a Steeler’s fan! When I read your comment on my blog,I thought “oh good, she’s a Cardinals fan!” It was SOOOOOOO CLOSE!!!! But close doesn’t count! Congratulations! Yup, I’m getting quite comfortable on my new sewing machine. But I know I’ll be totally intimidated when I take my first class and she ask me to do something and I look at her like a doe in the headlights. “duh, what?” 😉 O well. I’ll learn! it’s never too late, right? Manuela – what a great concept! I have been in a group where we meet and make meals that are frozen, but this concept is so simple. I love it!!! This is great! I’m snagging them all and I think that I’ll become a dump cook, too. Geart idea Manuela! I make a huge batch of meatloaf, freeze in the loaf pans and then take them out and wrap in freezer paper. When I need a good warm meal I put the frozen meatloaf in the pan and bake til done. I am going to try the teriyaki recipe. I am all about the dumping! We are thinking alike! I grilled (outdoors LOL) a whole lot of chicken because you can use it so many ways…and I made a cherry crisp! Isn’t that funny? Can’t wait to see your V decorations! 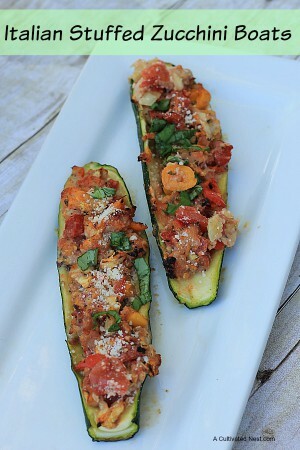 Oh, these look so yummy and so fast and economical. I love ease in the kitchen anymore! Thanks for sharing. That crisp looks good! Great dump cooking ideas! I need to do more of this, All sounds so good. Now where do go get the flax seed? I bought some long ago at a flea market and planted, was going to use it to spin with on the wheel. But life went out of state working. Sure wish I could find some. I go in, again, for testing tomorrow. I will go by the post office, and mail your loofah seeds. Since Christmas, I only left the house 3 times. So I will get them mailed, I promise. Wish the mail lady would just pick it up. I love the country, but when everything is so far, it takes an act of Congress, to get anything done around here. I had a baby goat Jan. 30. So cute. I have blueberry bushes, I am trying to root, Hubby’s Aunt gave us a Tree, lol, I went ahead and put the 2 bushes in ground. Never thinking something 3 inches round would live, been a month, and putting on sprouts, and I have a bunch rooting on the porch, and figs rooted! Yeah! When I buy them they die. I have grapes, and muscadines, growing. Now I need a Raspberry bush. All those recipes look extra yummy! We also eat a lot of chicken, much heathier! I am just transitioning from a part time job to full time next week, your post is perfect timing! Hopefully chicken will be on sale this week! P.S. I love your amarylis…mine is very far behind yours. I planted it a few weeks later this year. I may have to place it in a sunnier window to give it a jump start! Yes, thank you for the marinade recipes. We eat mostly chicken and ground turkey, trying to eat red meat only once in awhile. These will definitely come in handy. Thanks again! I love all the chicken recipes and what a great idea to freeze them. I love to use my crockpot so I like the idea of just taking them out of the freezer and dumping them into a crockpot or oven. Thanks! !